a tiny animal, as a mouse or fly. Reading about the Bucks County Almshouse (or Alms House, or Alms-house), I came across this wonderfully archaic word that probably went extinct with the dawn of germ theory. After a trip to the Spruance Library, we have identified our first unknown grave in Strangers Row. 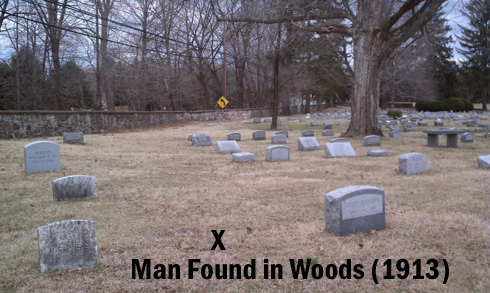 With Rayna’s help, I found two articles about our stranger listed only as “man found in woods” (d. 7/21/1913). He was a man about 60 years old named Cunningham, a pauper from the Almshouse who left on April 1st and probably died shortly thereafter. He was found wearing two shirts and two pairs of pants, with $4.62 in cash and a $1 watch. Edward Vorhees, of Newhope, while walking through the woods on the farm of John Huffnagle, near Newhope, at noon on Monday, stumbled over the corpse of a man. He notified the authorities at Newhope and they in turn called Coroner Howard P. White, who made an investigation in the afternoon. The man was unknown in that section a[n]d from the appearance of his hair it is [s]upposed that he was about sixty years of age. There was nothing on his person or clothes to identify who he was. He had almost white hair and wore two shirts, two pairs of pants and a blue coat. He was about five feet and six inches in height and had an Ingersoll watch and $4.62 in cash in his pockets. The condition of the body was such as to indicate that the man had been dead for at least three months, as nothing was left of him but a frame of bones. Near a tree was found an empty bottle and a cup, but what it had previously contained could not be learned. Near him was found a local newspaper, dated March 27, 1913, which was probably about the date of his heath. No one in the vicinity could give any testimony as to having seen the man, and the supposition is that he laid [sic] down to sleep where he was found and died. Coroner White gave a certificate of death from exposure and the body was turned to Undertaker Worthington, of Wycombe, for interment. The supposition is that the dead man was an inmate from the County Home who left that institution a few days before April 1, but there is no proof to sustain this theory. It has been announced by Coroner White, of the c[o]unty, that he has every reason to believe the body of the man found in Huffnagle’s woods on Monday, July 21, was that of a man named Cunningham, who was an inmate of the Bucks County Home until the first of April this year. In the dead man’s clothes was found a key which they think must belong to a trunk he left at the Almshouse. The trousers, coat and the clothing corresponded to that he wore while there and the agate drinking cup was like the ones with which inmates are supplied. When I read Rayna’s post about an unknown grave at Solebury Friends Meeting, the text of its headstone obscured by tree roots, I immediately knew the grave she was talking about. I grew up in that graveyard. We were the caretakers, and when my mother worked my brother and I went with her. We spent hours upon hours in the cemetery, finding ways to keep ourselves occupied. One of our favorite games was to jump from headstone to headstone, moving up and down the rows while our mother mowed. 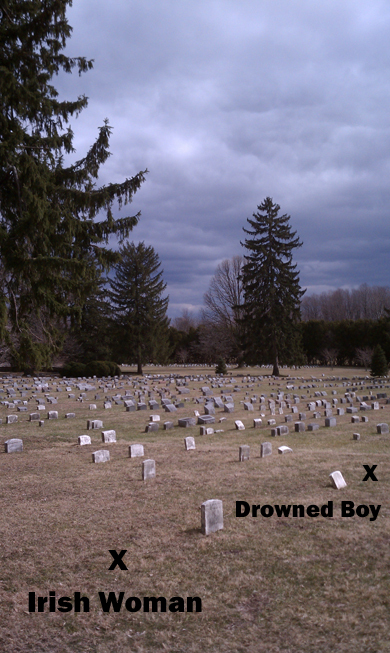 I’ve read every name on every headstone, connecting the roads and hills of Solebury to the old family plots (Ely, Paxon, Armitage, Kitchen, Pidcock, Magill). As a teenager I even dug some graves myself. I know the place pretty well. But this enigmatic tree-eaten grave gave me pause. Weren’t there other unknown graves? A fragment of a memory came back to me. Something about a man found dead in a tree. A stranger whose body was discovered and buried in the graveyard. I thought I’d read it somewhere, so I looked through some books (MacReynolds’ Place Names in Bucks County, Davis’ History of Bucks County) but found nothing. So I asked my father, who was the caretaker for about ten years starting in the mid-70s until my parents divorced. Did he remember anything about unknown bodies buried in the graveyard? 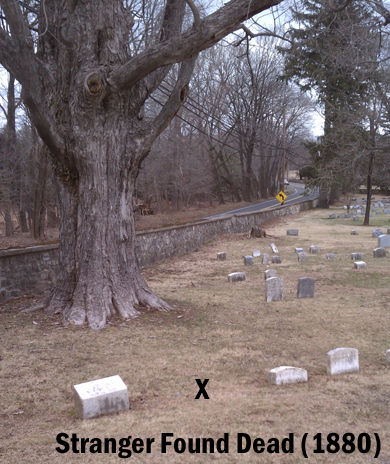 He thinks the tree stood on the left near the wall as you enter the graveyard from the meetinghouse, but it was no longer standing when he became caretaker. If it wasn’t a tree in the graveyard, it was definitely a tree somewhere on the meetinghouse grounds. The body was in the branches of the tree, not hanged. He thinks Rachel Franck, a member of Meeting that lived just south of the graveyard, used to mention the man in the tree occasionally. He was buried in Strangers Row. This last detail caught me by surprise. I spent the first seventeen years of my life in that graveyard, but I’d never heard of Strangers Row. They were not all strangers, he explained. That’s where they buried non-Quakers, across the lane from the oldest section of the graveyard (Perhaps called “strangers” to distinguish them from Friends?). Most of them were known members of the community, they just weren’t members of Meeting. However, he said that there were more graves whose occupants were in fact unknown. Could one of these be the man found dead in a tree? I headed to the graveyard to investigate. I came looking for a row of headstones, but what I found challenged a basic principle of my mental geography of the graveyard. Strangers Row was empty. My whole live I assumed that every grave had a headstone, but this open patch of lawn was full of graves, unmarked and unknown. Headstones are expensive, and even today new graves might be marked with temporary tags for years before a proper stone is installed (In this section I actually found a weathered plastic grave tag for Oscar Carter, deceased 1904). Whether they lacked the family ties or money, these strangers’ graves were left without a permanent mark. Analyzing the list of the dead, I made a startling discovery. It seemed like a disproportionate number of the dead in Strangers Row were children. In the first three rows, 74 of the graves are specifically listed as children, while only 67 are not. I doubt this can be explained by higher child mortality rates alone. A more likely explanation is that these children belonged to families who were not permanent residents of the community. Sometime after the children died, the families moved on and were buried elsewhere. 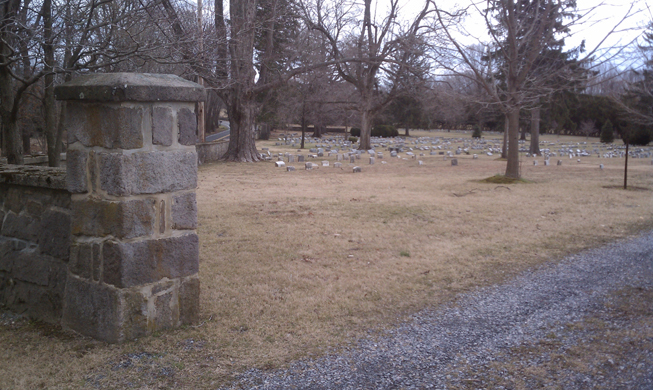 Furthermore, many of the adults buried had unique surnames, indicating that they were not related by birth or marriage to the members of Solebury Friends Meeting. To further complicate things, one plot (d. 6/7/1886, baby from home in Philadelphia) suggests that perhaps the meeting took some bodies in for charity. Does one of these graves belong to the man found dead in a tree? Was the story my father and I remembered a corrupted retelling of a man simply found in the woods in 1913? Or was he one of the other unknowns, listed only as a question mark on the record of graves? My father and grandfather had no further information. Maybe some other old timer at Meeting knows the answer. For now, my leads have gone cold. How did these two come to rest at Solebury Friends Meeting? No dates are provided. The first stone between them belongs to William Fennell, also undated. The other two Fennells were buried in 1871 and 1881, so it’s reasonable to guess that William died around the late 1800’s. The rest of the plots surrounding them are also undated, and almost all belong to children. Of these children, four have parents buried here, and those parents’ dates of death range from 1867 to 1906. This places the children’s deaths in the mid- to late 1800’s. What events brought them here? Why were they identified only by ethnicity and manner of demise? For now these reticent strangers will keep their secrets. “Unceasingly floweth the cold cold tide, of Death’s dark and lonly [sic] river. I spent yesterday afternoon in the Spruance Library with a fellow history writer browsing newspapers from the turn of the century. Somewhere between the news of the day (Unknown Tramp Found Dead Between Lime Kilns) and medical ads (Beware Treatments for Catarrh Containing Mercury!) I decided I should probably follow her lead and start my own Bucks County history blog.